"I have got GE to change a little bit, and I have changed myself. The two have converged." Over lunch with Jyoti Mukul, Banmali Agrawala, president and CEO, GE South Asia, discusses how GE is transforming itself into a digital industrial company. 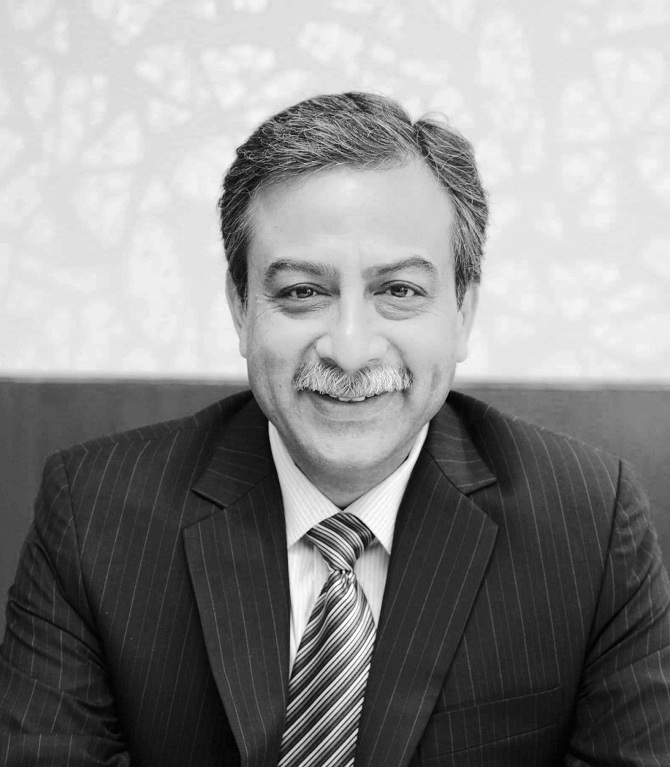 IMAGE: Banmali Agrawala, president and chief executive officer, GE South Asia. When I request a lunch with Banmali Agrawala, president and chief executive officer, GE South Asia, I am told that he would like to focus the conversation on how GE is transforming itself into a digital industrial company. We decide to meet at Amaranta at The Oberoi in Gurugram. Because of the hotel's unusual construction, one has to go down from the lobby right at the entrance to reach the restaurant a few levels below. I am one of the first ones to reach the restaurant. When Agrawala joins me, we decide to get over with ordering the food first. My guest opts for a vegetarian express luxury lunch, choosing the Niligiri Paneer Kurma option, and some fresh lime and soda. I go for a Chettinad Curry with Asparagus and a Broccoli Poriyal with Curry Leaf-Tempered Tapioca and Sannas, avoiding the south Indian makeover of the ubiquitous north Indian Paneer. As we settle down I ask why GE needs to change in the first place. "There were a couple of themes which Jeff Immelt (chairman and CEO, GE) brought in when he assumed office and one of them was to become global. The international business of GE outside the US at that time was just 30-35 per cent. Today, it is 60-65 per cent. He drove the agenda of getting global very hard and that meant getting stronger talent," says Agrawala. We are interrupted by a server, who places some Tomato And Lentil Rasam with Lentil Chekkalu before us. Agrawala takes a look and decides to skip the soup. We come back to the point he is making. For GE, globalisation meant buying from the cheapest source and selling where the price was the highest. "Today, globalisation means being more local in local markets. 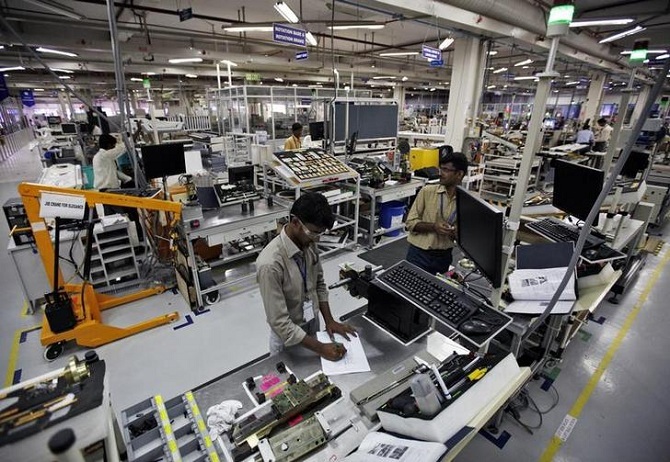 From that perspective, we have made a shift from being a more product-led company to a solution-driven company over the last five years," he tells me. The other theme is to make GE a pure-play industrial company, so it sold off GE Capital and bought Alstom's power business. The way the company deals with the government has also changed. "Earlier, we used to have a mile-long list of deviations from the tender and as a result, we didn't bid. Through a process of consultation with the government and PSUs, we now bid for government projects with zero deviation. We are willing to take on more risk and execute it." That came on the back of doubling of its business in South Asia over the last three years. Now the company sees substantial growth here since GE plays "right at the heart of every infrastructure business where the government is spending money. We have positioned ourselves to win and make opportunity". So, what did he learn from the whole change process? "I have got GE to change a little bit, and I have changed myself. The two have converged. "In terms of me changing, I learnt here the focus on performance and on delivering results in a timely manner. "In terms of changing GE, just the understanding of the market -- who are the likely partners, who are willing to take suitable risk -- was big. "I have been able to persuade and convince GE to be more aggressive. Today, GE in India is a very local company." I ask him how different things are at GE from the way they were at Wartsila and Tata Power, where he worked just before joining GE. "I used to be a gentle and soft guy and now I am a pretty tough taskmaster," he seems amused as he says that. "There is a sharp focus on deliverables and results here," he adds. "Now I am confident that if I make certain decisions, I will be backed up by the management." IMAGE: GE Healthcare employees work in their research and development facility in Bengaluru. For GE, globalisation means being more local in local markets.Photograph: Danish Siddiqui/Reuters. Is it possible for an old-economy company to become more like an IT company, like, perhaps, an Apple? "We do believe that the physical and digital will converge. You see software companies making devices, cars and here you have a hardware company making software. Remember, the internet of things has internet and things. Both have to go together," he says. At the same time, it is important for a company to remain attractive as an employer, he adds. "In many ways, we are fighting for the same talent as Google and Apple in the technology space." So, what is that key question GE asks a potential employee when it spots one? "We ask youngsters if they want to write code for computer games or want to do something for medical devices and aeroplanes? When they see you can make an impact, they get charged up." The organisation had to be more agile. "In these times, if you have a company that has stiff hierarchy and too many layers, which by definition will slow things down, it is not a place where youngsters would want to work," he explains. Is it a fact that Indian companies are more conscious of hierarchy than elsewhere in the world? "The next generation of business leaders, owners, entrepreneurs, and management are not like 30 years back when I started to work. They are not servile any more. They want a much more open system. They want direct conversation." Out meal arrives in a large steel tiffin carrier. The waiter unlocks it and places each of the three boxes -- coloured pink, yellow and blue -- in front of us. The aroma of authentic spices is irresistible. We dig right in. Do Boeing, GE have US permission to Make in India? Over the past one year, GE has introduced some new practices. One such is Fastworks, the basic idea of which is to improve speed. "We want people to experiment, but if you realise that a trial is not going well then you need to stop and move on. You cannot wait to perfect a product or a solution before you take it out to the market. If you have a broad idea, you take it out to the market, get a quick feedback and tune the product further and keep on making improvements. In a sense, it is an anti-thesis of the Six Sigma approach that GE had earlier," Agrawala says. The other concept is a mobile app, PD@GE, a unique performance development system. "Since things change fast, we cannot sit at the end of the year to give feedback. It will be a prepared session. We have done away with annual performance appraisal. If I am able to give feedback almost instantly, all one has to do at the end of the year is to take a summary and review." The new appraisal system was started in 2016. How different is working in a company like GE from working in an Indian company? "In the Indian context, the purpose of business is important. You cannot say that the only objective you have is to drive profit. You have to have a larger purpose in the Indian market. Once you begin to serve the people, business follows. Outside, where basic needs have been met, the focus can be much sharper on shareholder return, stock price etc. The context is different," he says. Such differences in context also teach one important life lessons. "Getting out of your comfort zone teaches you so much." Reaching Finland in 1992 while working for Wartsila after spending his growing-up years in Pune -- "a sleepy old place" -- he was hit hard by two things: One, there was hardly any vegetarian food available, and two, the temperature would fall to minus 32-40 degrees. "It wasn't normal for me, but it taught me something. You learn to deal with discomfort and make your way through." Agrawala sees growth coming from technology and data that can make assets more productive. "I would like to seed this idea in business and in the government. At the moment, we have a dozen conversations; I would like to have a 100."